Reflexite Photoelectric sheeting is designed for use with retroreflective type photoelectric sensors, either with or without the use of polarizing filters. The sheeting is composed of cube corner (microprism) retroreflective elements in a flexible, smooth-surfaced tough and weather resistant polymeric film. P82 has a solvent and weather resistant top coating for a longer life. The tape comes in a 2" roll in either a 10 foot or 50 foot length. It is available only in the silver / white color. Click Here for a spec sheet on this product. 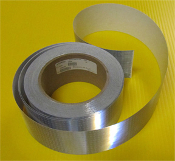 P82 Photoelectric tape is a very high quality specialty product. It has the same appearance as our V82 tape, however, it goes through extra production and testing to ensure that it meets 900 x 900 brightness. This product is used by various companies that make photoelectric/sensor devices, as well as government and university labs that use it for testing. You can make your roll selection using the drop down menu above.